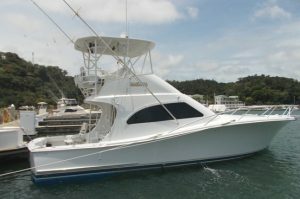 This tournament-ready 44ft Luxury Luhrs Convertible powered by twin Caterpillar 3136 600HP engines fishes out of Pez Vela Marina in Quepos. Experienced bilingual Captain Jesus Montero is at the helm, assisted by bilingual mate Memo. Fully equipped with fighting chair, tuna tubes, live well, bait prep station and insulated fish boxes, the boat has an a/c salon with an entertainment center, full galley, marine head with shower, a master stateroom with queen bed, and a guest stateroom with upper and lower berths. She carries a complete line of Penn International and Shimano tournament-class rods and reels, and has all the required electronic and safety equipment, including GPS, depth sounder, radar, fish finder, marine radio and a 13.5KW 110V power generator. Can pick up out of Herradura Bay if requested.